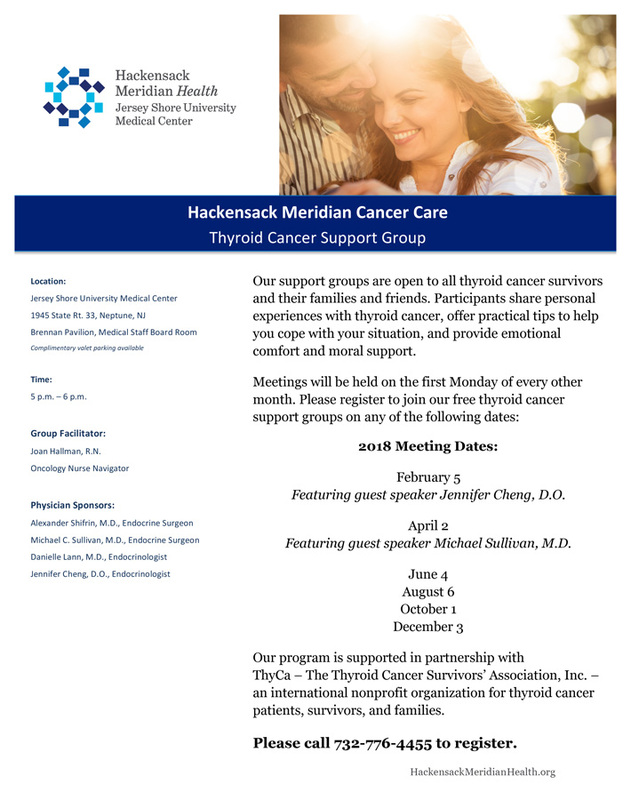 Thyroid Cancer Patients Support Group meetings are now being held once a month at Jersey Shore University Medical Center, in partnership with ThyCa. 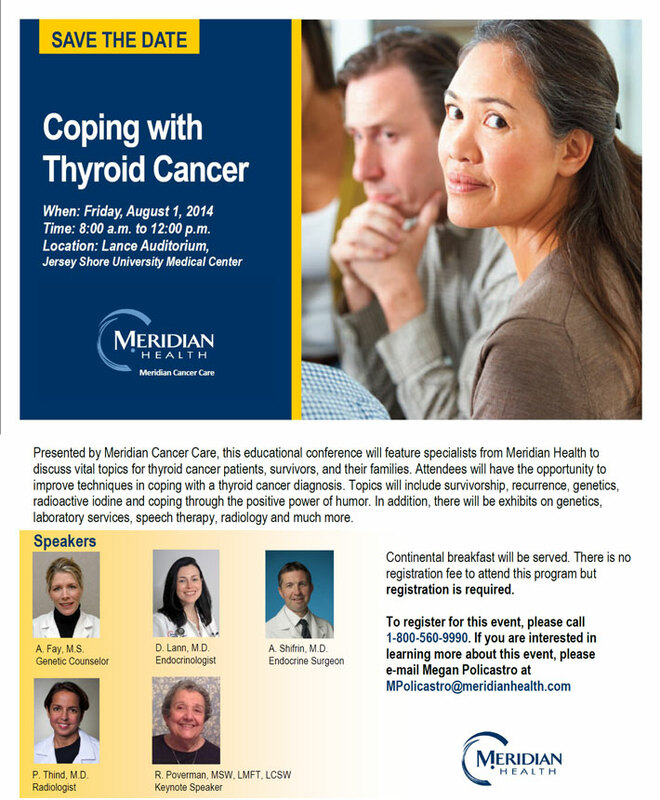 Jersey Shore University Medical Center is proud to host THE BIGGEST Thyroid Cancer Support Group in New Jersey. Dr. Shifrin discusses the monthly support group from Jersey Shore University Medical Center that is dedicated to patients dealing with thyroid cancer. The group is open to anyone affected by the disease including thyroid cancer patients and survivors, along with their family and friends. Our support group has been published to the ThyCa website. Check it out at http://thyca.org/sg/nj_neptune.htm. Neptune, NJ- A new thyroid cancer support group begins on October 3, 2011 from 6:00 - 8:30 p.m. at Jersey Shore University Medical Center. Attendance is free and open to anyone affected by the disease including thyroid cancer patients and survivors, along with their family and friends. The support group will be held in the Medical Staff Board Room at Jersey Shore University Medical Center located at 1945 Route 33 in Neptune. The theme of the first meeting will be ‘Living with Thyroid Cancer.’ During the meeting participants may share their own experiences and offer insight on how they are dealing with thyroid cancer. In following meetings, participants will be joined by speakers from surgery, endocrinology, radiology and speech therapy who will touch on various topics in the treatment and care of thyroid cancer patients. 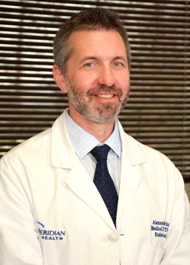 The thyroid cancer support group is being facilitated by thyroid cancer survivor, Donald L. Winters, R.Ph., MPA, OCR Manager/Research Pharmacist, from the Meridian Health Office of Clinical Research. This group is also being supported by Alexander Shifrin, MD and Megan Policastro from the Department of Surgery, and Sunil Asnani, MD and Danielle Lann, MD from the Department of Endocrinology, who are all very familiar with this cancer as well. A non-profit organization of thyroid cancer survivors, family members, and health care professionals. The association offers support, education and communication for thyroid cancer survivors, their families and friends. It sponsor's Thyroid Cancer Awareness Month, year-round awareness activities, and thyroid cancer research fundraising and research grants. Its support groups are free and open to any and all survivors and their families and friends. In these groups, people share thyroid cancer information and support. Participants share their own experiences and offer insights on how they are coping with thyroid cancer. The support group at Jersey Shore University Medical Center is affiliated with ThyCa and meets the first Monday of every month from 6:00 PM to 7:30 PM.